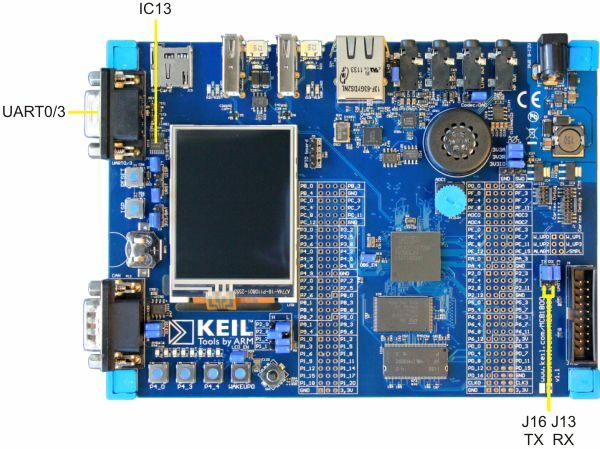 The MCB1800 board connects the on-chip serial UARTs to the ST3232C (IC13), which converts the logic signals to RS-232 voltage levels. The serial port (UART0/3) is configured as a standard 3-wire interface. The DB9 connector is wired directly to the ST3232C serial interface. Refer to the figure below for details. Jumpers J16 and J13 allow you to connect transmit data (TX) and receive data (RX) signals from the ST3232C to USART0 or UART3 on the MCU.